Dhanush, Amala Paul starrer forthcoming film Vela Illa Pattathari has completed its censor with U ceritification from the regional censor board. entertainer. 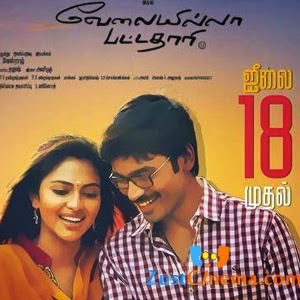 Vela Illa Pattathari marks 25th film of Dhanush in his film carrer. Samuthirakani and Saranya Ponvannan are playing key roles in the film. Dhanush tweeted "Dear fans, press and media. I'm super excited to announce that VIP has been censored with a 'U' certificate and will release on coming 18th,"
Vela Illa Pattathari is slated for July 18th release.